First: a note of appreciation to John and Maria Grist and their website, kunanyi/Mount Wellington History. 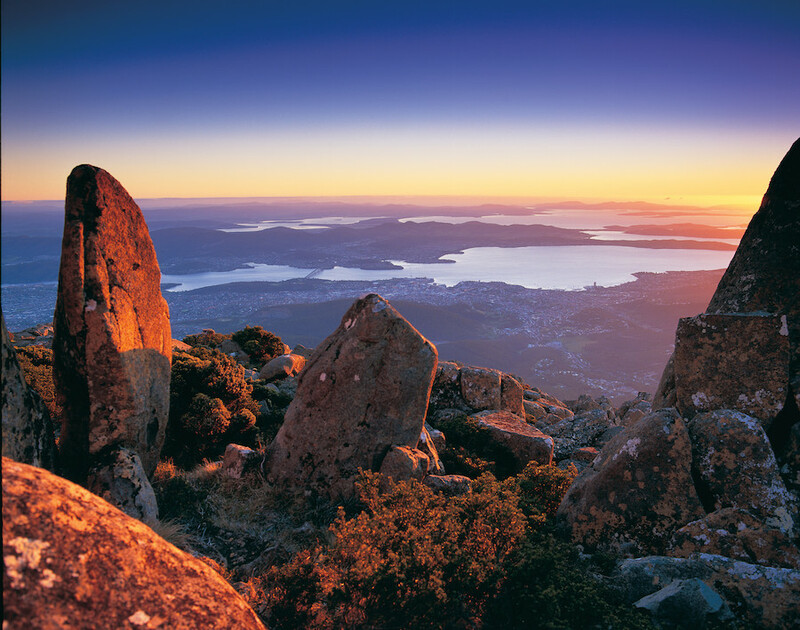 Mount Wellington, or “The Mountain” has always been close to the heart of Hobart residents. It is a giant presence which dominates our landscape, simultaneously blocking the view and drawing the eye. The Mountain is embedded deep in our thoughts and imaginations. From our city’s early days, the mountain provided an easily accessible retreat from the city. For many residents, walking was considered an important pastime. In 2001, Jess Abrahams performed an archaeological survey of the remains of the huts for the Hobart and Glenorchy Councils, the Wellington Park Management Trust and Parks and Wildlife. He produced a report called Wellington Park Mountain Huts Inventory. The report remains unpublished. Part of the reason for this is that the location of many of the huts must remain secret, because of the risk of vandalism. Here are some comments from the Tailored Tasmania webpage. “Wellington Park Ranger Ben Masterman”: Well said, Elk. In the early 1830s timber sawyers built huts at the King’s Sawpits, Brown’s Flat, which is today known as the Junction Cabin clearing. In 1843 Lady Jane Franklin had two huts erected on the mountain, one at The Pinnacle, and another at The Springs (Abrahams). In 1888 a recreational hut was built besides the King’s Sawpits, where the original sawyer’s huts had once been located. From that point onwards, the huts were “a fundamental part … of the mountain experience to locals for over one hundred years” Lee Andrews & Associates Heritage Consulting, p38. In the period 1890-1910 the hut building reached its peak. In all, through the nineteenth and early twentieth centuries, around forty small huts were built on the mountain. They were used as weekend retreats, bases for walking and skiing, or even as homes. They were built of local bush materials, with small touches of refinement, such as ornate mantelpieces, verandahs, bush lattice gables, bridges, fern gardens and cellars. One hut had a piano. Some were linked with telephone wire to warn of approaching guests. Far from dressing roughly for the bush, when visiting their mountain huts in the nineteenth century, Hobart people often dressed in their Sunday best. The huts became a popular destination for visitors of all kinds, and were featured on postcards of the time. In their glorious and detailed website, kunanyi/Mount Wellington History, and in their book The Romance of Mount Wellington, John and Maria Grist have archived many beautiful photographs and made them available on the public domain. The photos above are from there. They also give detailed descriptions of some of the old huts of Mt Wellington. This was built in the 1890s. The decorations around the top of the verandah were made from vines from the native creeper Clematis aristata. Clematis Hut was destroyed by arson in 1908, rebuilt, and then is thought to have been finally destroyed in the bushfires of 1920. This hut was built in 1890 in what is now Myrtle Gully. Again, there were two versions of the hut in the same location. A small flat area of land below the hut was once used as a tennis court. Built 1897, this hut was originally one room. Then two new rooms were built and the first became a toolshed. In 1901, a two-level bridge was built. “Camping Out” by Mary Salmon in The Sydney Mail and NSW Advertiser, Wed 26th December 1906. There were several huts with this name, run by the same group of people. An earlier version of Forest Hut was burned down. Today there remain traces in the form of flat areas, paths, and a rock mound with a hole in the centre which probably once contained a man fern, which has burnt away. Some other huts were: Fern Retreat, Wattle Grove, Grass Tree, Blue Bell, and Waratah Flats. In 1927, the Hobart City Council purchased the lower slopes of Mount Wellington from the Cascade Brewery in order to establish the Mountain Park. Up until that point, the hut owners had paid a negligible rent to the Brewery. Now those that remained were forced to give up their leases. These two huts can be found by walking on the Lenah Valley Track near The Springs. (See “Three huts on a trail” by Russ Grayson of Pacific Edge). Few of the huts have survived. Their rooves were made of bark or shingle and their walls were timber, and over the years the mountain has been subjected to many fires. Most of the huts are in ruins, but it is possible to find traces — moss-covered terraces and collapsed chimney bases hidden in little-known gullies. I repeat the caution. If you are lucky or clever enough to find the remains of any old huts, it is important to keep the location secret. Luckman’s Hut was built in 1938 by the Hobart Walking Club, near a small ski slope that is no longer used. It is also known as The Hobart Walking Club Ski Hut and is around two kilometres from the summit of the mountain, in the Big Bend area. After the 1967 bushfires, Roy Davies and other HWC members were instrumental in its restoration in the early 1970s (See “High on a mountain, a little stone hut” by Russ Grayson of Pacific Edge). The Scout Hut is a two-storey building complete with hammocks and an outdoor bathtub, as well as a chair wedged high in a rock, for enjoying views. It is also known as Moon’s Hut and Friends’ School Hut, as it was built in 1969, by a scout troop from The Friends’ School, and was designed by student, Olaf Moon. The materials came from a demolished home owned by one of the boys. Here is what Olaf says about the official standing of their hut. “It was approved “unofficially” by the bailiff in 1971, without a lease. The bailiff, Mr R Stean, put the lease application into the pending tray, where it sat until he passed away in 2001. It is just outside the Wellington State Park.” KHuts website. ” The huts are a gift to us from those that came before us, and their continued survival depends on users sharing with caring. Please don’t light fires outside except in an emergency. (Marshmallows in need of toasting doesn’t qualify, sorry! Nor does extreme dirtiness so please don’t count on a hot bath!) If you do happen to know the location of any of the huts, please BYO firewood if you must use the fire. There are a lot of unsightly broken and sawn off trees around the huts, which spoils the natural setting rather. Stoddart, E (2004) , The mountain: a people’s perspective, Hobart, Tasmania. Hobart City Council. Mitchell, Nicola (2001), “Wellington Huts, Functional and Flamboyant”, 40 Degrees South Magazine, No 20, Autumn 2001. Hobart, Tasmania. There was a ruined hut I visited as a kid, somewhere under Arthur’s Seat. You could walk up an old track to it, from somewhere in Lenah Valley (in keeping with the etiquette, I won’t post more detailed directions). There was a rough sign there from a guy called Victor, forgiving the people who “burned me”. My father enquired and what he heard was that the guy was a bit of a hermit who lived up there until someone who didn’t approve of him burned his place down. A bit sad, but an interesting day walk. My understanding was the rules about secret huts pertained to existing unofficial huts (late 20th century structures) rather than the very minimal remains of long gone timber huts, but perhaps it applies to these too. Some of the huts you mention are not secrets and are shown on the official maps. Yes, people are going to find most of them. I think this is more in the nature of a plea from concerned rangers and others that everyone is careful to preserve what is left.